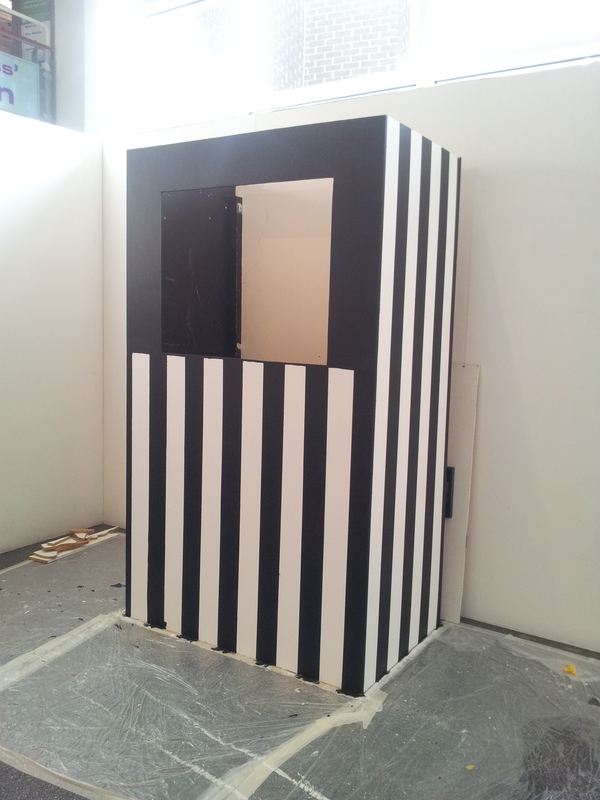 Yesterday Lara (Moving Image student) and I painted black and white stripes onto the theatre, making it look more like an actual theatre. Starting on the left hand side at the back we measured 10 centimetre spaces and drew vertical lines before protecting the soon-to-be white stripes with masking tape. I painted the top section of the front black and there is a shelf to be added, which I also painted black, along with the pelmet, which I sanded (for ages!) first. This entry was posted in sound and vision and tagged punch and judy theatre, sound and vision by Julia Fry. Bookmark the permalink.